« RV Gas Mileage – Can You Improve Your Results? Having just been through the process I can tell you that getting a Florida concealed carry permit is not a quick process. It is easy but it takes time! I will share with you here what it took for me to obtain mine! What is a Florida Concealed Carry Permit, or what some call a CWFL? 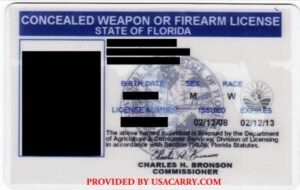 A concealed weapon or firearm license is a Florida issued license, a lot like a driver’s license. It allows the owner of this card to legally carry a concealed handgun or weapon in locations otherwise restricted by law. What weapons can be carried in a concealed fashion with this license? The CWFL allows the licensee to carry a handgun, knives, electronic weapons or devices, billies, and tear gas guns. 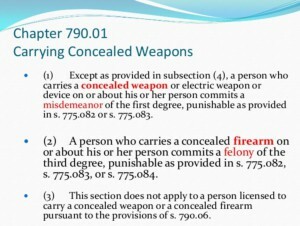 That does not mean you can carry others that are not specifically listed in Florida Statute #790.06. For example, metallic knuckles, throwing stars, and nunchucks are not legal to carry in a concealed fashion. Regarding municipal regulations, before you can start carrying any variations of these legal concealed weapons, beware. Florida law allows municipal ordinances to restrict what types of knives, electronic weapons, billies, and tear gas guns you may carry in your area. However, Florida state law does not allow municipal ordinances to regulate the carry of handguns. If you are carrying a concealed firearm, it must be carried on or about a person in such a manner as to conceal the weapon from the ordinary sight of another person. However, Florida law also provides that if you are lawfully carrying a concealed firearm, it is not a violation if you briefly and openly display the firearm to the ordinary sight of another person, so long as the firearm was not intentionally displayed in an angry or threatening manner. If you are in the possession of a concealed weapon then Florida law requires that you have your Florida Concealed Carry Permit and valid identification. Also, if you have a concealed weapon and a Law Enforcement Officer demands your CWFL, you should provide both your CWFL and valid identification. Florida law does not require it but it’s just a good practice as you will probably be asked if the situation arises. Where Can I Legally Carry a Firearm in Florida? In a motor vehicle if the firearm is in a secured case and carried for self-defense or other lawful purposes. 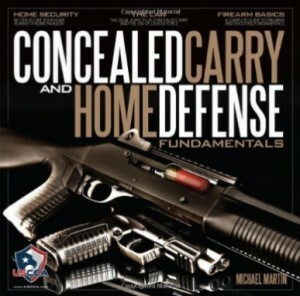 I will cover more about the concealed carry laws in Florida in a future post! For now, I’ll cover what you need to get the process started and how long it will take till you get your CWFL. There is a simple four step process for applying and receiving your Florida Concealed Carry Permit! Step One: The simplest and easiest thing to do is find a reputable source for a concealed carry class and sign up for that. If this takes place at a gun shop that also has a shooting range it makes it easy to fulfill the CWFL requirements because both the classroom portion and the shooting range requirement can be accomplished all in one session. I took a class at Shoot Straight while we were visiting Fort Myers, FL. The Instructor is a police officer and current firearms training instructor. He did a great job with the three-hour class! His name is Tony Lauer. He can be reached at Patriot Professional Firearm Training. I highly recommend going this route! A concealed carry firearms class will give you all the materials you need to fulfill the requirements to be ready to mail off your completed application to the Division of Licensing in Tallahassee, FL. Even if you feel you are an experienced gun owner, the class will help you to understand the laws regarding carrying a concealed weapon. A completed application. I got mine from the CWFL class. If you are a more experienced firearms person you can go directly to the Florida Department of Agriculture and Consumer Services and download and application there. Instructions are there to follow, if you prefer. A certificate of completion from a training class. This can be any firearms training conducted by a state-certified individual. It can also be an NRA safety or training course, or any equivalent. You will need documentation of citizenship and residency like a Driver’s License, Passport, State ID, or Voter Registration. A passport photograph. In my CWFL class, they took the photo for me and gave me two copies to send with my application. A legible set of your fingerprints large enough to ensure the application and fingerprint card lie flat and are not folded or creased. A check or money order for $112 if you are submitting a hard copy of your fingerprints and $70 if that process is done electronically. I chose the hard copy because it cost $5 to have a local police station to fingerprint me and the electronic feature was a bit more of a hassle and basically equaled the $112 fee. And, if needed, court documents reflecting the final disposition of any arrests. 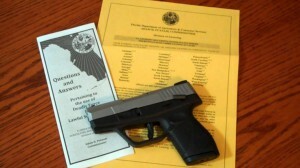 Step Four: If approved you will receive your Florida Concealed Carry Permit in four to six weeks. They do say they have up to ninety days to approve or disapprove an application for many reasons. You want to be sure that when you send it in you have everything included and that it is all correct. You don’t want to have to go through the process twice! It took me the full three months to receive my CWFL license! The Division of Licensing pushed it right to the ninety-day timeline. And I think I know why! So many in Florida are applying for these permits that it is taking them that long to process all the applications. The concealed carry class I took was filled, and all of them on the calendar were the same way. So, that is what it will take to get the job done! I hope you found this information useful! As a full time RVer, being able to legally carry a concealed weapon is of great importance to me and my family! The crooks are armed, and so should I. It is important to know the laws and be ready should the time come to not let someone else take your life! Good luck as you begin the process and continue to investigate all the considerations required when you decide you want to carry a concealed weapon in public places! Thanks for stopping by our website Jose! we will shortly be taking a 6 month trip around the USA in our RV, I’m looking at getting my CW license here in Florida but as we will have sold our house before we go I wont have a fixed residence address in Florida until we get back and buy a house again, any idea how I am able to overcome that? Our family will be taking care of our mail at their address while we are away. We use My RV Mail as our permanent physical address and have since 2010. That is where our address is also registered for our Concealed Carry License out of Florida where we are domiciled.